Think of Bose and think of audio equipment of exceptional quality because this multi-billion dollar American company goes back all the way to the 1960’s and is now known for its superior products in the market. Bose has always maintained its prestige over most of its competitors by producing good quality products which are very durable and very often exceed expectations. Not only does Bose produce home theatre systems, but also headphones too. If you wish to carry with you the best audio there is to offer, then you may want to check out these babies. The Bose QuietComfort 35 II is more than just a pair of headphones. Built in with Google Assistant, you can make and receive calls, play music, quickly get answers to your questions. Just press the Action Button and start a conversation with your new assistant. Want to be alone with your music? This is meant for you because the noise cancelling features are remarkable. If you’re spending the entire day out and want to have music with you, not to worry because the QuietComfort 35 II has a battery life of 20 hours on a full charge and a quick 15 minute charge will get you another 2 hours. Be prepared for better bass and music like never before with this device that is also made with impact-resistant material. Want your music to be deeper, more powerful, and well-balanced? The QuietComfort 25 lets you enjoy more than that! This pair of wireless headphones is powered by a single AAA battery that should last you 35 hours of music. Put them on and feel the world of difference with immersive sound quality that separates you from the noisy surroundings with its noise-cancelling technology. With the QuietComfort 25, you’ll notice that the headband is closer to your head for a steadier grip, ear cups rotate more for a better fit, and it is made of high-quality lightweight material. There are 2 models of the QuietComfort 25, one meant to be paired with Android phones, and the other for iPhones. If you want to have music as your motivation to push yourself further when you work out or are engaged in sports, look no further because the SoundSport Wireless Headphones has earbuds that stay secure and comfortable in your ears while stable and powerful audio pushes yours forward. Bluetooth and near field communication (NFC) pairing let you connect to your phone with ease. The sweat resistant and weather resistant SoundSport Aqua is your best companion when you’re training be it rain or shine. A full charge will last you up to 6 hours of usage and it comes with a 1-year manufacturer’s warranty. 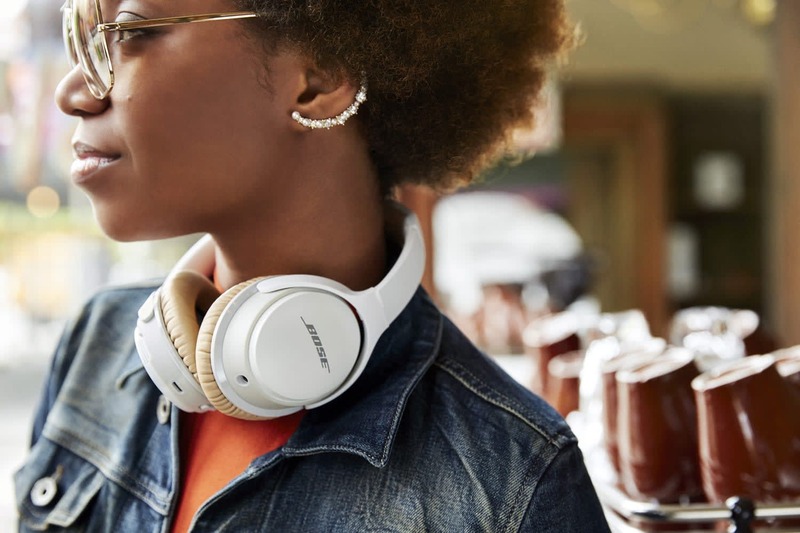 Enjoy music in brilliant detail when you have the SoundLink On-Ear because this pair of on-ear wireless headphones has rich and absolutely clear audio. It is powered by a rechargeable battery that will last you 15 hours of playtime and it can even take voice prompts to set up the Bluetooth pairing and receive notifications. The headphone is made of durable lightweight material and has adjustable headband rests to fit you comfortably. Inbuilt dual microphone system lets you take calls while reducing background noises to make sure you can converse clearly outdoors or even in noisier environments. The wireless range of this device is 30 feet. If you are looking to enjoy deep immersive audio at any volume, then the Around-Ear II is the thing to get. Connecting up to 2 Bluetooth devices at any time, you can be sure not to miss a call. The microphone cuts down ambient noise and delivers a much clearer sound for both ends of the call. This pair of light wireless headphones has up to 15 hours of playtime so you can bring your music just about anywhere you go. Built to give out more bass, with the Around-Ear II you can get the best audio and really feel the music. If you spend a fair amount of time of your day in crowded or noisy environments, then you’d probably have thought of shutting yourself from the outside world so that you can focus on doing what you need to do. The QuietControl 30 lets you do just that and you can set the level of noise cancelling you want while maintaining a well-balanced audio performance. This ergonomic neckband design is not only cool but also comfortable, you would hardly notice it due to the lightweight design which also has an inline control for you to manage calls and volume. With Bluetooth and NFC pairing, you will be able to enjoy the best that music has to offer. Not too crazy about noise cancelling but need an affordable pair of headphones for your workout or sports? Then the SoundSport In-Ear is ideal for you. Get energized with full balanced sound to push you further and you need not worry about sweat getting into your device because it is sweat-resistant. An inline microphone lets you make and receive calls when you are on the move, control panel lets you adjust the volume and skip tracks without having to reach for your connecting device. This wired headphone set is not only light but also durable. This model is compatible with Android devices only, a different model (of the same name) is compatible with iOS.